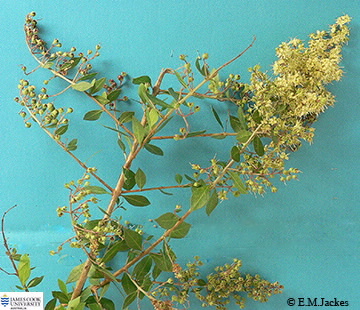 This small tree or multi-branched shrub is related to the Crepe Myrtles. Stems often appear twisted, bark often flaky; the broadly lanceolate leaves are simple and alternately arranged on the stem. Flowers in terminal panicles, fragrant, petals free, white to cream. Capsules globular to 2.5 cm diameter at maturity, persistent. If you are growing this tree for its flowers then you need to cut off the capsules after flowering. The dry leaves when powdered and made into a paste are used as the dye 'henna'. Flowers at first glance may be confused with Bursaria sp. (Mock orange) but the leaves and capsules are quite different.